Forget about Anne Boleyn’s influence during her own time, gracing Henry’s court with French sophistication. Her fashion sense, the French hood and her long, pointed sleeves, set the trend for other ladies to follow. Everything she did, introducing dances from France and designing changes in her clothes, became ‘the thing’ for any woman who wanted to succeed the way Anne had. Forget about the King’s Great Matter, his love for Anne that forced him to break with his wife and the Pope. He forged his own church where the Bible and services were conducted in the English language, a move leading to the creation of a great literature. The New Learning and New Religion spread like fire across the land as a result of Anne’s own interest in these subjects. Don’t consider the role Anne played in the fall of one of the most powerful and shrewd political advisors in history, Cardinal Wolsey. Had this man continued to play politics with Henry’s kingdom, who knows what might have happened. With Wolsey gone, Henry was forced to take a more active role in governing his country. For better or worse, Henry felt his power and, once experienced, he would never let it be usurped again. Forget that marriage to Anne brought England’s ties closer to France than Spain, allowing Henry to play one country against the other for the remainder of his reign, something he could not have done married to Catherine of Aragon. Forget that after Anne’s execution, Henry was never quite the same. His transformation from Prince Charming to Towering Tyrant began when he put the woman he had loved and pursued for almost a decade to the sword. What you can remember is Elizabeth, Anne’s daughter, who ruled a peaceful England for almost 45 years. Under her rule, England’s literature flowered with the works of Shakespeare, Marlow, Donne and others. England became a major player in European politics and a solidly Protestant country where tolerance was experienced, at least during Elizabeth’s first years. Her horizons expanded as English ships traversed the oceans, claiming far- off lands for the Crown. 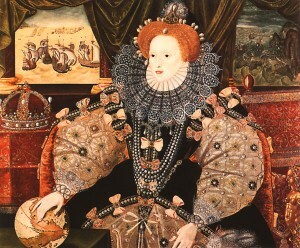 A new sense of nationhood and pride flourished, with Elizabeth as the iconic Gloriana. This was Anne’s daughter. Anne’s courage, audacity, pride and intelligence ran through Elizabeth’s veins as surely as Henry’s blood. No sword could remove Anne’s presence from her daughter, Elizabeth. Barnhill’s article gives a wealth of most interesting information presented with efficiency in a polished and graceful style befitting Anne Boleyn herself. We couldn’t be prouder!! Your continuing achievements sometimes boggle our minds. However, if you never achieve another thing, we will remain equally proud of you for who you are! Our deep and committed love to you remains forever..
Wow, it is an amazing article. Congratulations!! !